NEW ORLEANS — No man has had more of an impact on the collegiate record books over the first six weeks of the collegiate outdoor track & field season than Pennsylvania senior Sam Mattis. Texas A&M sophomore Ioannis Kyriazis made sure his name would be remembered for a while, too. Kyriazis and Mattis proved that if the season ended right now, it could very well be called, "The Year of the Thrower." Both of them also impressed The Bowerman Watch List Committee enough to be included on the mid-April version of The Bowerman Watch List, which was released Thursday by the U.S. Track & Field and Cross Country Coaches Association (USTFCCCA). Devon Allen RS SO Oregon Hurdles Phoenix, Ariz.
Ronnie Baker JR TCU Sprints Louisville, Ky.
Edward Cheserek JR Oregon Distance Newark, N.J.
Ryan Crouser SR (i) Texas Throws Gresham, Ore.
Sam Mattis SR Penn Throws East Brunswick, N.J.
Zach Ziemek SR Wisconsin Combined Events Itasca, Ill.
Also Receiving Votes: Jake Blakenship, Tennessee; Christian Coleman, Tennessee; Myles Hunter, Minnesota State; Fred Kerley, Texas A&M; Karl Saluri, Georgia; Shaquille Walker, BYU. Kyriazis and Mattis replaced Texas A&M freshman Donavan Brazier and Minnesota State hurdler Myles Hunter. Oregon’s Devon Allen, TCU’s Ronnie Baker, Oregon’s Edward Cheserek, Texas’ Ryan Crouser, Arkansas’ Jarrion Lawson, Oklahoma State’s Nick Miller, Akron’s Clayton Murphy and Wisconsin’s Zach Ziemek all remained on the Watch List. We’ll start with Mattis — because how could we not? It was at the Philadelphia College Classic where Mattis — in only his second meet of the season — unleashed three gigantic discus throws, all of which ended up among the all-time, top-10 throws. Mattis’ first heave soared 67.45 meters (221 feet, 3 inches) for the third best all-time. His fifth throw (67.21m/220-6) comes in at third and Mattis’ last effort of 66.51m (218-3) is now ranked sixth. Then there is Kyriazis, who as a freshman won the SEC javelin title and finished fifth at NCAAs. Now a sophomore, Kyriazis is looking to improve on that and had a whale of a throw at the Clyde Littlefield Texas Relays. On a weather-delayed day, Kyriazis launched the spear 81.87 meters (268-7). That put Kyriazis as the eighth best performer in collegiate history and just two feet off the all-time chart. What about Crouser and Miller, the other two throwers on the Watch List? Well, Crosuer exhausted his eligibility after winning the indoor shot put title and Miller hasn’t competed for the Cowboys since the 2015 NCAA Indoor Track & Field Championships. To wit: This was Crouser’s 21st career Watch List nod. If Crouser appears on each Watch List up to the outdoor championships, he’d tie former Arizona star Lawi Lalang for most career appearances (24). Speaking of athletes whose last names start with "L," Lawson has yet to compete in his signature event (long jump) this season. The 2016 indoor champ did run an open 200 at the Texas Invitational this past weekend. As far as those athletes who have opened their season, Allen, Baker, Murphy and Ziemek stood out. Allen hasn’t lost an individual event this season and established personal bests in the 100 and 200 and is near a career best in the 400 hurdles. He is the national leader in the 110 hurdles with a time of 13.40 that the sophomore ran March 18 at the Willie Williams Classic. Baker leads the nation at 100 meters after a wind-aided 9.95 at the TCU Invitational in mid-March. He’s one of two DI men to crack the 10-second barrier in 2016. Murphy had a strong showing at the Texas Relays, where he won the invitational section of the 800 against a talented field that included UTEP’s Jonah Koech and former Olympian Leo Manzano. Ziemek tallied a career best 8047 points in the decathlon earlier this month and set PRs in six of the 10 events in the process. Cheserek ran one race this season — the 5000 at the Pepsi Invitational — and finished second to Washington’s Colby Gilbert. 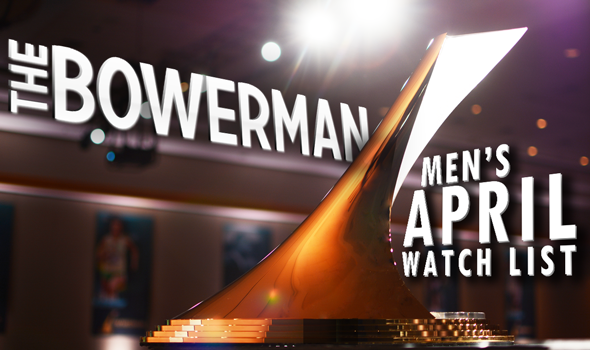 Athletes who received votes from The Bowerman Watch List Committee, but not enough to be on the Watch List included Tennessee’s Jake Blakenship, Tennessee’s Christian Coleman, Minnesota State’s Myles Hunter, Texas A&M’s Fred Kerley, Southeastern Louisiana’s Devin King, Georgia’s Karl Saluri and BYU’s Shaquille Walker.